Lead was above 100 ppm in one-third of all the hoses (11 of 32). Elevated lead was found in flexible PVC hose parts and metal fittings. In Table 1, hose parts with >100 ppm lead are listed in decreasing order of lead concentration. In the metal fittings, 13% of hoses (4 of 32) contained lead ranging from about 500 to 16,000 ppm. In the flexible plastic hose part, 22% of hoses (7 of 32) contained at least 100 ppm lead, 13% (4 of 32) contained at least 2,000 ppm lead, and 7% (2 of 32) contained in excess of 50,000 ppm lead. The two with very high lead levels of 6.8% and 5.6% are listed first in Table 1. Table 1. Hose parts measured by XRF to contain >100 ppm lead, listed in order of decreasing lead concentration. Plastic hose layers and metal fittings are separated. Lead levels >2,000 ppm are highlighted in pink. Lead levels 100-500 ppm are highlighted in green. Bromine in the vinyl hoses is strongly correlated with antimony (correlation coefficient R=0.87). Antimony trioxide is a very common flame retardant synergist used in combination with BFRs. Bromine in the hoses is also strongly correlated (R=0.86) with lead. Lead is frequently found in PVC e-waste because it is commonly added to cable and wire insulation as a stabilizer. Bromine in the hoses is also strongly correlated with other elements found in e-waste, especially copper, rubidium, tin, and gold. A recent investigation by our team (Miller et al., J. Environ. Protection Vol.7 No.3, Feb. 2016) found recycled PVC from e-waste being used in vinyl floor tiles. The XRF signature of these garden hoses is similar to that of the tiles. Tin in PVC plastic suggests the presence of organotin compounds. Organotins are stabilizers that protect PVC from degradation by light and heat and are common in electrical items like wire and cable insulation. Tin was measured between 3,000 and 4,000 ppm in three of the PVC garden hoses, listed in the first three rows of Table 1. Not coincidentally, those hoses also had the highest lead, bromine, and antimony of all the tested hoses. They also had much higher than average levels of elements found in e-waste: gold, copper, and rubidium. These findings make a strong case for the presence of recycled PVC from e-waste being used in these hoses. Phthalates, or ortho-phthalates, are a class of plasticizer chemicals, six of which are banned in children’s products in the United States above 0.1%. We used FTIR to detect phthalates and other plasticizers in the plastic parts of the 32 hoses. Phthalates were detected by FTIR in 56% of all 32 hoses tested. Phthalates were only found in PVC hoses, not in the eight hoses made of other polymers. Of the 24 PVC hoses, 75% contained phthalates. Two alternative, safer plasticizers were detected in PVC hoses: Dioctyl terephthalate, or DOTP in 63%, and a trimellitate in 6%, or two hoses. In the phthalate-positive hoses, the phthalate signature was readily identifiable in the FTIR data, meaning the concentration was likely above 1%. Three hoses were also analyzed by an external lab (See Methods section) to determine which phthalate species were present. The results are in Table 2. All three contained multiple phthalates (DEHP, DINP, DIDP, and others) with total concentrations between 1% and over 8% of the weight of the hose. One drinking water safe hose, Element RV and Marine, was included. It contained two phthalates, DNUP and DNP. These phthalates are not regulated nor have they been studied adequately. (Chronic Hazard Advisory Panel on Phthalates and Phthalate Alternatives, CPSC July 2014) This hose’s label said “Meets California Toy Standards for Phthalate Content,” which is true. These results help validate our FTIR results, as we identified ortho-phthalates in the FTIR spectra from the same hoses. Table 2. Mass spectrometry measurement of plasticizers in three hoses. Also, the presence of multiple phthalate species in a single hose such as the HDX in Table 2 suggests the possibility of recycled PVC—which is derived from many products and thus contains a variety of phthalate species—as the source of plastic. In contrast, most phthalate-plasticized vinyl products we’ve analyzed previously contain only one or two major phthalate species. Table 3. 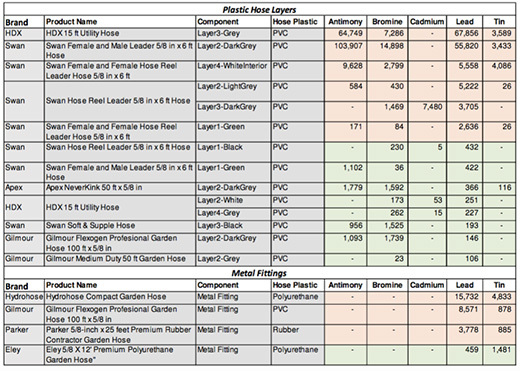 Comparing chemicals of concern in PVC and non-PVC hoses. Bromine, antimony, and tin in PVC strongly suggest brominated flame retardants, antimony trioxide, and organotins, respectively. Table 4. Comparing chemicals in hoses labeled safe versus not safe for drinking. Bromine, antimony, phthalates, and DOTP were found in flexible PVC. Lead was found in both flexible PVC and in brass fittings. DOTP is a safer alternative to phthalates. Overall, hoses labeled “drinking water safe” had significantly fewer chemicals of concern and in much lower amounts, particularly lead, antimony, and bromine. However, phthalates were in some of the drinking water safe hoses. Table 4 above summarizes. Table 5 gives details of these hoses. Phthalates were less likely to be present. The most common plasticizer was DOTP, a safer alternative to phthalates. None of the drinking water hoses contained lead above 100 ppm, antimony, or tin in the flexible hose layer. Bromine was either low or undetectable. Bromine and antimony were elevated in over half of these hoses. Lead was greater than 100 ppm—the limit in children’s products—in 50% of the hoses and greater than 10,000 ppm in three hoses (14%). Elevated lead was more frequently found in the flexible vinyl hose layers than in the metal fitting. Seven of the hoses were subjected to a leaching test. Tap water was held in the hoses for 48 hours, after which the water was tested for contaminants. Table 6 displays the results. One sample contained BPA at 87 ppb. The other two did not have detectable BPA (limit of detection 2 ppb). None contained detectable phthalates (limit of detection 5 ppb). The 2016 leaching tests found fewer contaminants in hose water than did prior years’ leaching tests. In particular, phthalates were not detected in the 2016 hose water from two hoses containing phthalates (Apex Neverkink and Element RV & Marine). This is in contrast to 2012 and 2013, in which phthalates were measured in all three water samples from hoses. See Table 6. The reason for the difference is not known. The one anomalous result was from the Swan female-female leader hose, which had over 5,000 ppm lead but did not leach lead. Table 6. Results of water leaching tests in 2012, 2013, and 2016. For this year’s hoses, lead concentrations in the plastic part of each hose are given in the last row. Click here to download a table containing a summary of results for each hose.